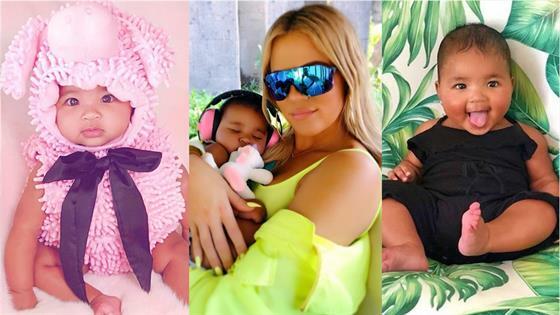 Khloe Kardashian, Eva Longoria, John Stamos and Gabrielle Unionare among stars who are celebrating their first Christmas as parents. "Merry Christmas!" Kardashian told True early on Christmas Eve, as she crawled on the floor towards a big strawberry toy, as seen in a video she posted on her Instagram Story. Kardashian welcomed the child, her first, with Tristan Thompson, eight months ago. She also shared on her Instagram Story photos and videos of Christmas gifts for True. One pic shows three pairs of sneakers and is captioned, "Thank you Daddy." True also received a stuffed penguin and elephant, a pink toy guitar and a name bracelet. Later in the day, mom and baby were spotted at the annual Kardashian-Jenner Christmas party. Stamos and wife Caitlyn McHugh welcomed their first child, son Billy, several days after True. The happy family spent Christmas 2018 at Walt Disney World. Longoria posted on her Instagram page sweet photos of her 6-month-old son Santiago, her and husband Jose Bastón's first child together, enjoying his first Christmas. Union welcomed her first child, daughter Kaavia, in early November. The actress, who is also a stepmom to husband Dwyane Wade's three kids, shared on Instagram a sweet photo of her with their newborn baby girl days before Christmas. "Vacation has officially begun," she wrote. "And there's a candied ham in my future. Joy to the world @kaaviajames finally asleep. Life is good." Check out more photos of stars celebrating their first Christmas as parents. The reality star's daughter True Thompson is all smiles on her first Christmas! On Christmas Eve 2018, the actress' boyfriend and Walking Dead star Norman Reedus shared this first glimpse at their baby girl, born about two months prior. The Fuller House star, wife Caitlyn McHugh and their baby boy Billy spent Christmas 2018 at Walt Disney World. Longoria posted on her Instagram page this sweet photo of her 6-month-old son Santiago. The first-time mom (and longtime stepmom) celebrated Christmas 2018 with husband Dwyane Wade and their newborn baby girl Kaavia. The actress shared this photo of husband Dwyane Wade and their daughter Kaavia on a boat in Miami on Christmas Eve. The Real Housewives of Atlanta alum and husband Marc Daly celebrate their first Christmas with 1-month-old daughter Brooklyn. The Jersey Shore star posted this photo of him, girlfriend Jen Harley and their baby girl Ariana with Santa over Christmas 2018. The Breaking Bad alum's wife Lauren Paul posted this adorable photo on Instagram over Christmas 2018. Other stars celebrating their first Christmas as parents include Kylie Jenner and Travis Scott, Cardi B, America Ferrera, Pippa Middleton, Kate Upton and Justin Verlander, Kirsten Dunst and Jesse Plemons, Troian Bellisario and Patrick J. Adams, Jordin Sparks, Rachel McAdams and Diane Kruger, whose boyfriend and Walking Dead star Norman Reedus offered a first glimpse of their baby girl, who is about two months old.